will be shared on television Jan. 25. LAHAINA -- Maui teen-ager Kristin Paresa enjoyed watching National Geographic films of exploration on television but never imagined she and hundreds of other Hawaii students would be part of such an expedition. "It was really exciting," said Paresa, 17, a senior at Baldwin High School. As scientists begin to explore the Hawaiian Islands Humpback Whale National Marine Sanctuary in waters off Maui, they are nurturing young minds, developing a new generation of researchers. Nearly 300 Hawaii students have conducted scientific experiments aboard ships and submarines over the past three days, through the Sustainable Seas Expeditions. "If they can have their imaginations fired, then there's hope for the future," said project director Sylvia Earle, 64. "We have to communicate as early as possible to the younger generation, because in a few years they will take over." The five-year program is exploring the United States' 12 marines sanctuaries. Hawaii's is the 10th to be visited. While sanctuary waters include parts of all the major Hawaiian islands, the expedition is focusing on the channel west of Maui, where humpback whales abound. The project, estimated to cost $20 million, is coordinated by the National Geographic Society in cooperation with the National Oceanic and Atmospheric Administration, with major support from the Richard and Rhonda Goldman Fund. The first phase began this week with scientists testing equipment and involving youth in experiments and the gathering of marine information. Yesterday, Paresa -- who wants to be a marine biologist -- observed whales migrating off Maui, worked with scientists aboard a research vessel, and surveyed the reefs off Lahaina. For a number of students, such as Farrington High School sophomore Barney Dois, this was the first ride on a boat and a submarine. "I didn't know there were so many sea urchins. There was a carpet of them on the bottom," said Dois, 16. In the same cabin as they descended to a depth of 104 feet was Baldwin High School senior Michael Crabtree, who recorded ocean information on a chart. "What's the surface temperature?" he asked. "Seventy-eight point six degrees Fahrenheit," said co-pilot David Larsen of Atlantis Submarines. Larsen asked for the lights to be turned off in the submarine. The cabin darkened slightly but remained lit with the glow from the ocean filtering through the glass portholes. Larsen said that at this depth, the colors red and orange tend to become muted. The students let out an audible "ooohh" when they saw Earle approaching in a one-person submersible. The second phase of the expedition, which begins next week, involves intense scientific exploration. Using two ships and two one-person submersibles, Earle and other scientists will be deploying instruments for a long-term monitoring program. The information collected at these sites will be used to determine any adverse changes in the environment. Scientists also will be recording the current, temperature and ocean depth and taking a visual and acoustic survey of sanctuary waters. Whitlow Au of the Hawaii Institute of Marine Biology will be attaching a high-resolution fish finder to the submersibles. The fish finder will allow observation of communities of fish, squid and shrimp during their evening and nighttime migrations. Earle said that scientists will be working with University of Hawaii oceanographer Rick Grigg to study "drowned reefs," which are sometimes located 120 to 150 feet below the ocean surface. Citing Grigg, Earle said the reefs were created 20,000 years ago, when the ocean level was lower and it was possible to walk from Maui to Lanai. She said she hopes the expeditions develop a greater understanding of the ocean and its inhabitants and the importance of preserving them. Earle said that less than 5 percent, and perhaps less than 1 percent, of the ocean has been explored. "We're exploiting it without knowing what's there," she said. "We can't lose it, because we can't make any more of it." Earle and other scientists are scheduled to talk about the expedition and show recordings of the dives. They will appear at 8 a.m. Jan. 25 during a national broadcast of the KidScience program on the state Department of Education's distance learning channel. 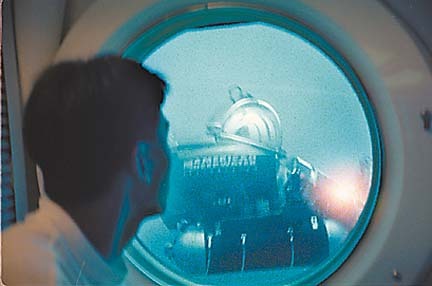 If you'd like to take a look at a model of the deep-sea submersible DeepWorker 2000 being used in the explorations, stop by the Waikiki Aquarium. An exhibit featuring the model opened yesterday and will run through Feb. 6. It coincides with the Sustainable Seas Expeditions mission under way until Wednesday in Hawaii. The expedition represents the first systematic exploration of the deep waters of America's National Marine Sanctuaries System. The Hawaii mission, led by Sylvia Earle, marine biologist and National Geographic explorer-in-residence, is largely devoted to the humpback whale. Using DeepWorker 2000, scientists are diving to little-explored depths to gather data. Sanctuary waters ring the continental United States as well as Hawaii and American Samoa.